Captain O'Neill was the General Superintendent of Police in Chicago at the turn of the 20th century. He preferred the title Captain, to Chief or Superintendent, which perhaps give us some insight into the man. By any measure he lead an exciting life. He was born in County Cork and there he learned to play the flute. At the age of sixteen, he was given a letter of introduction to the local bishop. His family sent him off to a life as a priest but he had a change of mind and ran away to sea. He circumnavigated the globe and was later shipwrecked in the Pacific. He was rescued and landed in San Francisco. He did some ranching in Montana before going to Chicago by way of New Orleans and Missouri. In Missouri, he married a young lady, Anna Rogers, whom he had met when she was an outbound passenger on one of his voyages from Ireland. He and his wife moved to Chicago in 1870, shortly before the Great Chicago Fire in 1871. He came to Chicago to work as a sailor on the ore boats that cruised the Great Lakes. They still haul iron ore by ship from Duluth to the mills in East Chicago and Gary. Fate intervened and the Captain ended up as a patrolman on the Chicago Police force. He was on the force less than a month when he was shot by a burgler. He carried the the bullet, lodged near his spine, till his death. Even though he was wounded in the shoot-out he still managed to arrest the felon and bring him into the station. Not a small feat when you consider that patrolmen in those days walked their beat. The Captain gathered many of Chicago's Irish musicians in an organization that they called the Irish Music Club. With the help of the Club and James O'Neill, his nephew, he began to collect and publish Irish Music. He also became a champion for the music as revisionists started to make claims that the music might be of origins other than Irish. His response to the suggestion that the English dancing master, Playford, was responsible for writing some Irish tunes was impressive. He published his collections of tunes in a series of books in the early part of this century. Some of them have been in print ever since. The Captain's papers and reference materials are archived at the University of Notre Dame. For the complete story of the Captain I can't recommend highly enough the biography that Nicholas Carolan wrote, "The Harvest Saved". A great book with some excellent photos of the turn of the century Chicago and the musicians of that day. Try and get a copy, you can order it from the publisher, Ossian Records and Books. "The Harvest Saved" cover, displayed below, was scanned for us by Nora McConville. 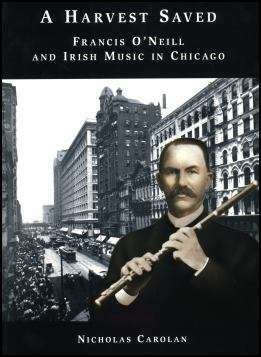 It's a scan of the copy of the book that Glenn Cumiskey, of County Armagh and an associate of Nickolas Carolan's at the Irish Traditional Music Archive, presented to the Irish American Heritage Center when he was in Chicago. This is the cover of one of Captain O'Neill's better known titles, "O'Neill's Music of Ireland". It's commonly called the "1850" for the number of tunes. Mel Bay Publications still prints this book and some others that the Captain and his Irish music group collected. This edition has a reproduction of the original cover. Some editions have modern covers and recently there has been released a revised version of at least one of his titles.